If you like Soundcloud - you need to check this out. Until.AM is the brain child of two Helsinki based developers / music lovers Aaro Väänänen and Tuomas Karhu. 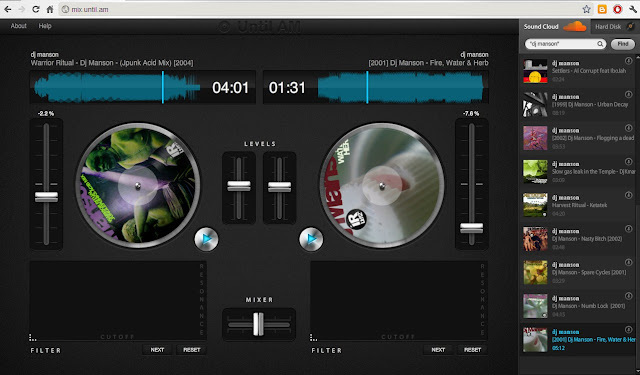 It is still in the early beta stage - and lacks a cue monitor or nudge buttons, but it is very fun to play around with and it works well, even if beatmixing is a challenge. Simple but effective, Until.AM looks like a very promising project, all in all. The application is cloud-based.& it runs in your browser [it can also play files from your HDD]. There is nothing to install, and you don't even need to log into Soundcloud. ...and so is your Nan. Tip: If you want to find all your uploaded Soundcloud tracks easily, search your "user name" in quotation marks. I'm gone to tell my little brother, that he should also pay a quick visit this website on regular basis to get updated from latest information.